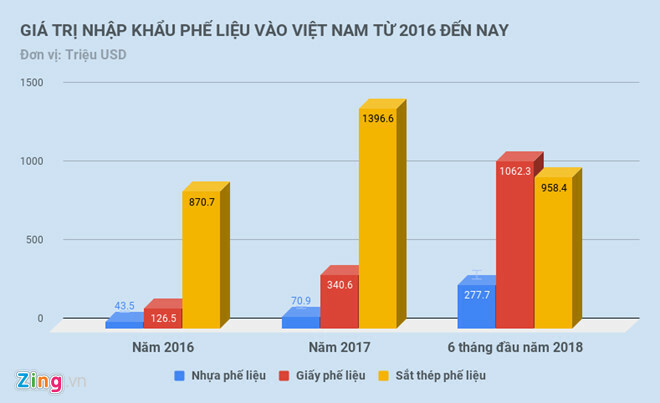 According to the General Department of Customs, Japan, the United States, Korea are three countries that Vietnam imported most scrap last time. Scrap is mainly imported plastics, paper, and steel. This afternoon (30 July), the General Department of Customs held a press conference on the management of customs on imported scrap. According to the press, Customs said that in the first half of 2018, the country imported about 4 million tons of scrap tires. In particular, the import of scrap plastic is 277,000 tons, scrap paper is 1.06 million tons, iron and steel scrap is 2.7 million tons. Total import value of scrap in the first 6 months is USD 1.2 billion, meaning that Vietnamese imported USD 200 million per month. Earlier, in 2017, Vietnam imported 5.5 million tonnes of scrap worth $ 1.8 billion; In 2016 it was 4.9 million tonnes worth nearly $ 1 billion. In the countries where Vietnam imports the most scrap, Japan, the United States and South Korea. Imported scrap materials are scrap plastic, waste paper, and scrap iron. As a result, all three types of scrap, the most import sources of Vietnam are Japan, the United States, and South Korea. Each month, the average Vietnamese spent about $ 97.7 million to import scrap from these three countries. At the press briefing, Deputy General Director of Customs, Mai Xuan Thanh, stressed the increasing import of scrap at seaports in Vietnam. Many containers import scrap port as no owner, no one to pick up, causing difficulties in gathering work. The number of waste containers is in stock at the ports of Hai Phong and Cat Lai (HCMC) to about 5,000 units. The number of containers that existed in Cat Lai as of July 25 was 3,579. Of these, 594 containers lasted 30-90 days; 2,423 containers survived more than 90 days; the remaining is less than 30 days. In Hai Phong, as of July 5, the total number of residual scrap containers was 1,495 containers, of which 1,342 containers of plastic waste. In reply to the press about the responsibility of the customs authorities in the occurrence of smuggling smuggled into Vietnam, Mai Xuan Thanh said that this agency is only the unit assigned the task of customs clearance. While the licensing of scrap imports into Vietnam is the responsibility of the Ministry of Natural Resources and Environment (MONRE). Procedures for importing scrap into Vietnam still have many loopholes that make enterprises take advantage of, while the authorities are difficult to investigate and handle. 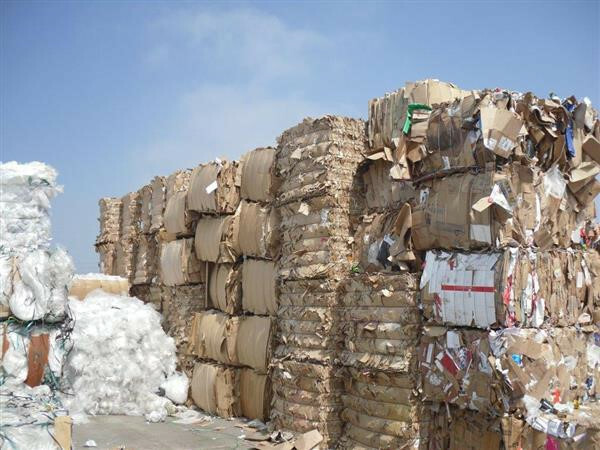 Paper is one of the types of scrap is imported to Vietnam the most. Photo: Customs. Nguyen Khanh Quang, Director of the Anti-Smuggling Investigation Department (General Department of Customs), said that the list of enterprises certified to import scrap materials as raw materials for production was issued by the Ministry of Natural Resources and Environment. This list has never been posted to the national gateway, so customs and seaports are difficult to know which businesses are licensed or not. In addition, customs clearance procedures when the import enterprises are also the loophole, can be completely forged making the management very difficult. Not to mention, local DONRES are also competent to license scrap imports. With the container backlog at the port, the anti-smuggling agency can hardly find the real owner. “We invited them not to come to the office but it was not true. There is also a reference to the original certificate issued by MoNRE. The process of investigating a smuggled or abandoned enterprise in the port is very difficult, “Khanh said. Mr. Mai Xuan Thanh emphasized that customs will tighten import of scrap in the coming time. In addition, containers of illegally imported scrap will be required to be re-exported.